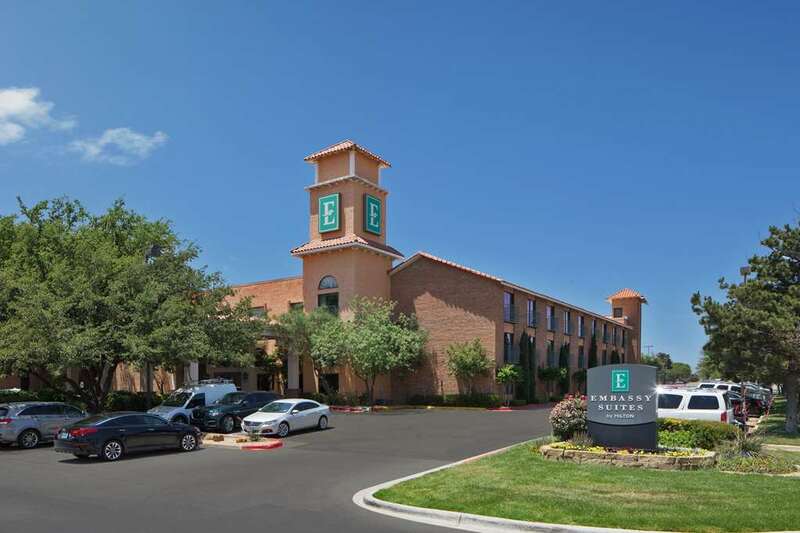 This hotel is 100pct non-smoking Step inside the Embassy Suites Lubbock hotel in Texas and experience impeccable style and service beginning with a warm welcome in the stunning open-air atrium lobby. This all-suite hotel offers 156 spacious suites each featuring a private bedroom and living room with a sofa bed as well as spacious areas for complete comfort and relaxation. Enjoy convenient amenities such as two 32-inch flat-screen HDTVs featuring premium cable and complimentary internet access. Begin your day with a complimentary cooked-to-order breakfast and be welcomed back after a busy day with the complimentary Evening Reception*. For alternative dining options Canaletto*s is open for an enjoyable dinner in a relaxed yet elegant atrium setting in the evenings or throughout the day for an occasional snack. Guests also appreciate on-site services such as an indoor pool and a fitness center. Planning your next meeting or event is easy at the Embassy Suites Lubbock hotel. The team of experienced staff is on hand to advise and help you find the perfect room and layout whether it*s one of our most professional conference rooms or a lavishly decorated ballroom for your wedding reception. Guests on business will also appreciate the fully equipped business center offering professional amenities such as a printing service. * Service of alcohol subject to state and local laws. Must be of legal drinking age. Canaletto*s: Canaletto*s restaurant is open for an amazing breakfast 600am to 900am Monday through Friday and on weekends from 730am to 1030am. Also enjoy an Italian dinner in a relaxed yet elegant Atrium setting in the evenings from 500pm - 1100pm.